Whether you are young or old, beginner or expert, first-timer or competition junkie, Nordic Skiing most definitely fits the bill for those with a thirst for competition. Such events can take you all over the world - meeting kindred spirits, sharing tips with fellow enthusiasts and learning from the experts. Cross-country ski races, covering multiple kilometers, are regularly held by fundraising organizations, some events having traditions going back nearly a hundred years or more. These are open to everyone from 'fun-skiers' to hardened experts and have a great atmosphere of fun and enthusiasm. 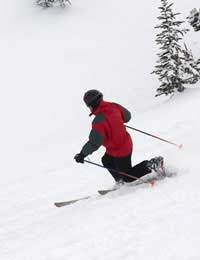 Ski clubs also host FIS sanctioned races for national ski association members as well as recreational participants. (See 'Distance Competition Events'). Biathlon is one of the most popular Winter Olympic Nordic ski events and involves skate skiing coupled with target shooting. It is fast, furious and highly skilled - holding a rifle steady with a heart rate of 120 is not easy! Because of the huge amount of cardiovascular work involved in this activity, many tri-athletes are turning to this as a fantastic winter-training discipline. Ski-orienteering is a very popular sport in Scandinavia. As well as classic cross-country skiing skills, it requires a certain degree of map reading expertise, route planning and teamwork. It is perfect for those of you who prefer team events to individual competitions and at the same time doing something that taxes your brain as well as your body! This is another event at which, like biathlon, you can do at every level from fun-for-all to representing your country at international meetings. Backcountry races take competitors to exotic winter wonderlands and obscure isolated locales like the North and South Poles. Races that cover over a hundred miles of tundra wilderness exist and are some of the most extreme endurance sports events to be held. Telemark competitions are similar to alpine ski events and involve more extreme terrain, speed, jumps and aerial maneuvers. The competitions can be on- or off-piste and often have more of a 'snowboarding' atmosphere with great music playing out over the course. Cliff-dropping can be mandatory!